Notice that each card you hold is also held in the other nine hands up top. Now click Draw. All ten hands receive their own unique draw. The three hands that are lit up are winners, so I receive payouts for one three of a kind and two two pairs. How Do Multi Hand Games Work? Each Coin is worth $0.25 in this example, so 50 times $0.25 = $12.50/deal. Each of the ten hands is an individual five coin, or $1.25 bet. After you select which cards to hold and click Draw, each of the ten hands has its own separate draw. The cards you held remain the same, but each hand then draws from its own individual deck of cards. This means that you can actually receive the same card in two or more of the separate hands. 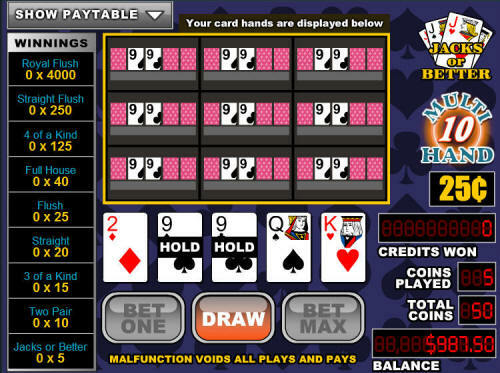 Multi hand video poker games are typically offered in 3-hand, 5-hand, 10-hand, 25-hand, 52-hand, or even 100 hand games. The more hands you're running per deal, the more money you'll be betting per deal but the less variance you'll see per deal. 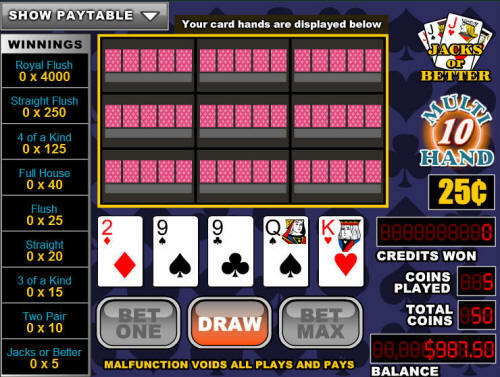 One thing to keep in mind is that multi hand video poker games will have much less variance than single hand video poker games. Since you are running multiple deals and draws per hand, your standard deviation for each round will be greatly reduced. This helps you achieve a payout percentage in the short run that is much closer to the actual long run pay percentage. Although the variance is much lower at these games, you can still go broke quickly because of the larger bet sizing. In the example above I was betting $12.50/hand, even though I was only playing a $0.25 machine. This is because I was playing five coins per hand and playing a total of ten hands. This doesn't actually affect the house edge, but it may put pressure on your bankroll if you don't have much money to play with. 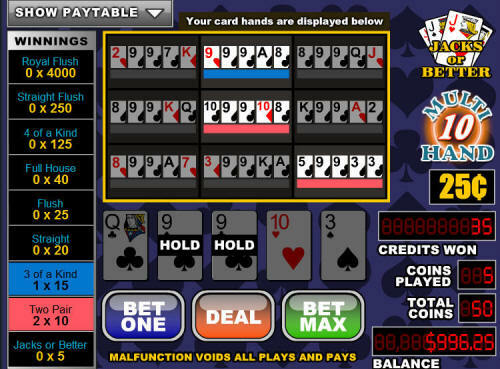 If you want to try out multi hand video poker, we suggest checking out Bovada Casino because they have a great multi hand video poker game that doesn't even require you to sign up!